What are the Happyforce Scores? The scores allow you to discover in more detail what is happening in your organization. 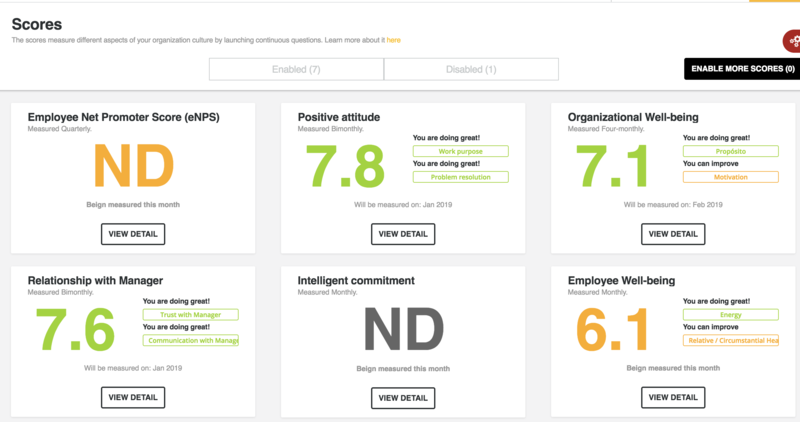 Through a series of questions created by HR experts and regularly launched to your employees, Happyforce is able to measure and understand more concrete aspects that will help you improve the climate in your organization. 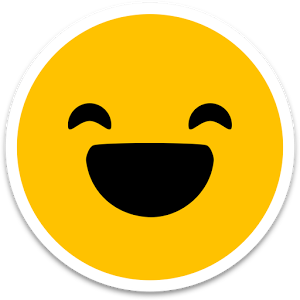 Happyforce has a score catalog, which you can activate depending on what you want to measure. For example, if you want to measure Problem Resolution in your organization, you simply have to activate the score, and Happyforce will take care of the rest. A score is a KPI or an Indicator that is calculated regularly by sending questions to your employees. What is a Score made up of? Each of the scores is composed of one or more factors that measure different aspects that impact the indicator. How are the scores measured? When a score is active, Happyforce distributes the employees in each of the factors. 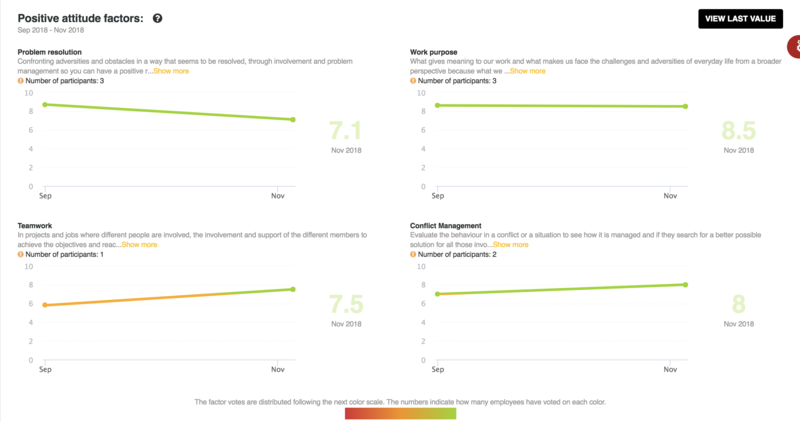 For example, in the 'Positive attitude' Score, for a 'Employee A', the employee will receive questions that initially measure the 'Problem Resolution' factor. In the next cycle, this employee will answer questions regarding the next factor, for example: 'Teamwork', until this employee completes all the factors. The objective of this approach is to obtain a holistic view of the whole indicator taking a larger sample. How often are they measured? Depending on their nature, each score can be measured monthly, bi-monthly, quarterly, quarterly, bi-annually or annually. Thus, at the beginning of each month, Happyforce evaluates the scores that are to be measured, and distributes them in fortnights in order to distribute the volume of questions to the employees.